There are 2 extant species of lizards known to be venomous, the Gila monster (Heloderma suspectum, with 2 subspecies) and the Mexican beaded lizard (Heloderma horridum, with 4 subspecies). There is ongoing debate regarding possible venom production by some other lizard species such as the Komodo dragon (Varanus komodoensis), but there is no current evidence to support human envenomations by any other lizards,  and these will not be further discussed in this article. A Gila monster (Heloderma suspectum). Photo by Michael Cardwell. The Gila monster is found in the desert regions of Arizona, western New Mexico, southeastern California,  the southern tip of Nevada, extreme southwestern Utah, and northwestern Mexico. The beaded lizard is found only in Mexico and Guatemala, south of the range of the Gila monster. Both lizards have heavy bodies with large heads and powerful jaws. 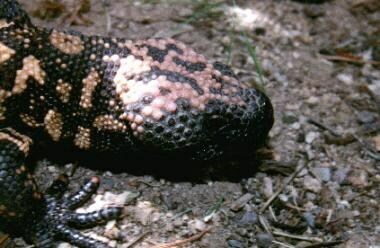 The beaded lizard is larger than the Gila monster, reaching almost a meter in length, whereas the Gila monster's maximal size is approximately 0.5 m.
Close-up of the head of a Gila monster. Clearly evident is the bulging musculature of the jaws, which gives this animal a tenacious bite. Photo by Holly McNally. The teeth (approximately 20 per jaw) are grooved and loosely attached to the jaws. 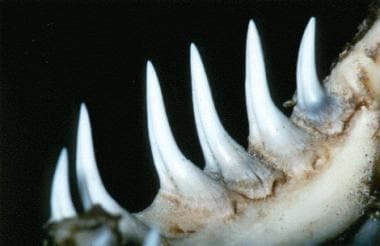 Venom is conducted via capillary action along these grooves into the victim's tissues as the lizard bites and chews. The more irritated the lizard is when it bites, the more it salivates and the greater the venom yield. Effective envenomation in humans probably occurs in less than 70% of bites. The dentition of a Gila monster. The grooved surfaces of the teeth are evident. These grooves allow for venom movement from the venom glands into the victim's tissues. Photo by Michael Cardwell. Bites are very infrequent and usually involve captive specimens. A significant number of bites probably go unreported because private keepers of these protected lizards may be reluctant to seek medical attention. No data regarding current incidence of bites by venomous lizards in Mexico are available. No data are available to support any racial predilection to lizard bites. Young males are more likely to intentionally interact with venomous wildlife, and are, therefore at greater risk for bites. While there are no large studies reporting the age distribution of venomous lizard bites, it is likely that those at greatest risk will be children, adolescents, and young adults. Young children may be at increased risk of bites if they come across a wild Heloderma specimen, as they may not comprehend the risk. Adolescents and young adults may be more prone to intentionally interact with or collect such lizards, despite knowing their venomous nature. The prognosis is excellent for those with a lizard envenomation, although pain may be an issue for many days. 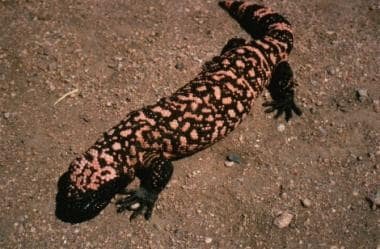 No substantiated deaths caused solely by a Gila monster bite have occurred in the United States.19 It is believed that a prolonged bite received by a small individual, such as an infant or toddler, could result in death. Bitten victims should receive instructions regarding standard wound care, elevation of the bitten extremity, signs and symptoms of infection, and medications to be taken. Patients should be educated to avoid close interactions with potentially dangerous wildlife in the future. Fry BG, Wroe S, Teeuwisse W, et al. A central role for venom in predation by Varanus komodoensis (Komodo Dragon) and the extinct giant Varanus (Megalania) priscus. Proc Natl Acad Sci U S A. 2009 Jun 2. 106 (22):8969-74. [Medline]. Beck DD. Biology of Gila Monsters and Beaded Lizards. Berkeley, CA: University of California Press; 2005. 1-211. Strimple PD, Tomassoni AJ, Otten EJ. Report on envenomation by a Gila monster (Heloderma suspectum) with a discussion of venom apparatus, clinical findings, and treatment. Wilderness Environ Med. 1997 May. 8(2):111-6. [Medline]. Mebs D. Clinical toxicology of Helodermatidae lizard bites. In: Handbook of Clinical Toxicology of Animal Venoms and Poisons. 1995: 361-366. Piacentine J, Curry SC, Ryan PJ. Life-threatening anaphylaxis following gila monster bite. Ann Emer Med. 1986. 15:959-961. [Medline]. Bou-Abboud CF, Kardassakis DG. Acute myocardial infarction following a Gila monster (Heloderma suspectum cinctum) bite. West J Med. 1988. 148(5):577-579. [Medline]. Preston CA. Hypotension, myocardial infarction, and coagulopathy following gila monster bite. J Emerg Med. 1989 Jan-Feb. 7 (1):37-40. [Medline]. French RN, Ash J, Brooks DE. Gila monster bite. Clin Toxicol (Phila). 2012 Feb. 50(2):151-2. [Medline]. Torp KD, Simon LV. Pulse Oximetry. 2018 Jan. [Medline]. [Full Text]. Torp KD, Simon LV. Toxicity, Lidocaine. 2018 Jan. [Medline]. [Full Text]. Ramos-Matos CF, Lopez-Ojeda W. Fentanyl. 2018 Jan. [Medline]. [Full Text]. French R, Brooks D, Ruha AM, Shirazi F, Chase P, Boesen K, et al. Gila monster (Heloderma suspectum) envenomation: Descriptive analysis of calls to United States Poison Centers with focus on Arizona cases. Clin Toxicol (Phila). 2015 Jan. 53 (1):60-70. [Medline]. Brown DE, Carmony NB. Gila Monster: Facts and Folklore of America's Aztec Lizard. 1991. 1-126. A Gila monster (Heloderma suspectum). Photo by Holly McNally.